When it rains, some events and activities such as baseball games, school excursions or barbecur parties are cancelled or postponed. When they’re cancelled, they’re completely crossed out and won’t happen at all. When they’re “postponed” though, they’ll just be moved to a later date. For instance, you can postpone a meeting today and reschedule it for tomorrow. I’ll give you some example sentences. The baseball game was postponed due to rain. You have to postpone your departure until Friday. You have decided to postpone buying a new car. 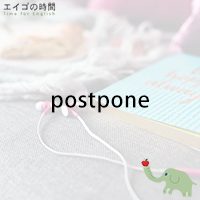 Now, sometimes, you postpone something “indefinitely”. “Indefinitely” means there’s no fixed end. When something goes on indefinitely, you don’t know when it ends. When a meeting is postponed indefinitely, you don’t know when it will happen.